Our programs distinguish Juniata from other liberal arts colleges. 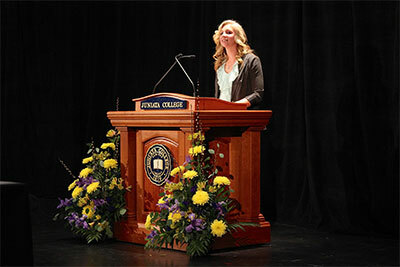 Juniata's highly competitive and much anticipated speech competition, The Bailey Oratorical, attracts the attention of the community on campus and beyond. 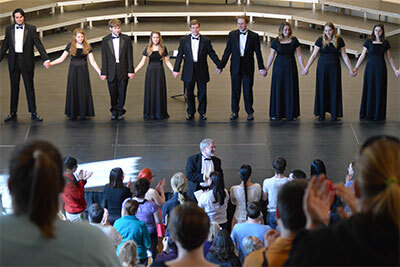 The Juniata Choir tours the United States and the world, performing for venues packed with people who may know of the College solely due to the renown created by generations of vocalists who have been a part of that extended family. The Baker Institute for Peace has extended the philosophy and impact of the Brethren pacifist tradition to countries on five continents. The three programs above help shape Juniata's character and are supported at least in part by endowed funding. But many others that can and should be--our award-winning effort to help acclimate new students, the InBound Program, our Center for International Education, our burgeoning internship program, to name but three--have yet to be supported by endowments. What kind of programs can be supported with endowments? Typically, endowments can support experiences that complement the academic experience and are not covered by the general operating budget. Program funds can support athletic teams or the art museum, activities like instrumental music or summer research, enhancements like lecture series or visiting scholars, acquisition funds for the library, or academic centers. 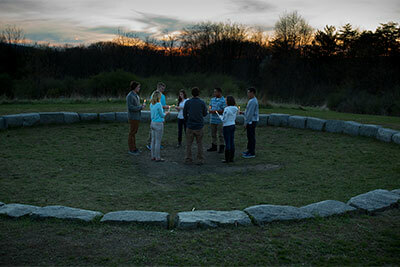 While the College has priority areas for which we seek endowed support, the tradition of community deliberation at Juniata runs long and deep. Program funds allow donors the greatest latitude and creativity in leaving a legacy, and thus we welcome ideas. What size gift is necessary to establish a program fund? Generally, if one wishes to help support a particular activity or department, the minimum to establish a program endowment is $50,000. With such a principal, the fund will yield around $2,500 per year to be spent for the purposes outlined when the fund is established. Some special program funds are exceptions. One can establish a named library fund for a minimum of $10,000. Lectureships are endowed with gifts of $100,000 or more, and cultural events can be endowed with $50,000. However, because program endowments can support so many different things, it is best to discuss specifics with a member of the advancement team. What if I am thinking big—supporting something critical to Juniata’s mission, like international education? Some centers serve the strategic objectives of the College. They are developed with a combination of seed money and grants and are often made permanent by the timely and visionary support of individuals or small groups of people. The Baker Institute is one such example. The home of Juniata’s Center for Entrepreneurial Leadership is the Bob and Eileen Sill Business Incubator, also supported by a program endowment. Juniata has made the endowed support of two key centers a priority in the near term: a Center for the Scholarship of Teaching and Learning and our Center for International Education. The former is critical to our maintaining faculty teaching strength, and the latter is central to our mission. In the next few years, we seek to raise endowment funding in excess of $1 million for each center. How do I know what kind of things to support? Put simply, talk with a development officer. Look at the strategic plan. Think about who you are. Express your interests and your ideas. You simply start the discussion, and we will involve the faculty, staff, and students to act on it.